Because the safe and efficient operation of a carbon sequestration project integrates many sophisticated instruments and produces intensive data, DIAL-GCS takes an intelligent approach to monitoring. 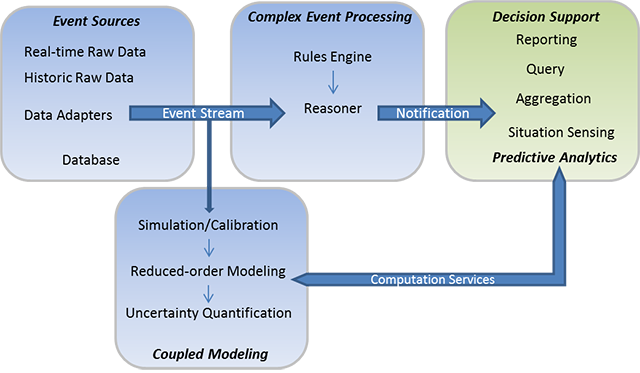 Leveraging recent advances in machine learning technologies, complex event processing, reduced-order modeling, and uncertainty quantification, among others, DIAL-GCS will develop and demonstrate a closed-loop monitoring system that will automate geologic carbon sequestration and track carbon dioxide as it flows within storage reservoirs. The system will be validated using both real and simulated data from one of GCCC's historical field projects. DIAL-GCS is funded through DOE's Carbon Storage program.